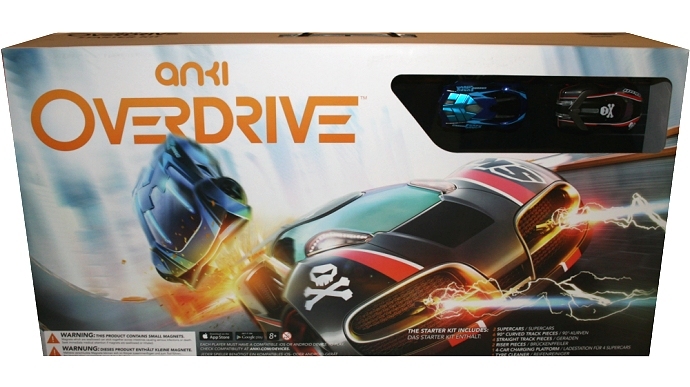 The new racing game Anki Overdrive comes packaged in a starter kit, it seems to be the ideal car game aimed at kids and if i’m honest, adults aswell – especially those of us who used to play scalextric sets when we were younger. For many, the opinion appears to be that the Anki Overdrive starter kit is a bit pricey for a kids toy, over in the UK for example, the starter kit comes in at around £150 on Amazon, for this you get a basic track setup, two cars and all the other components you need to start racing – except for one major thing – a controller for each car. I will look into this aspect a bit further down. For now – lets take a look what Anki Overdrive actually is, and what it can do. In the Anki Overdrive Racing Game Box. The game comes neatly packaged in a large box as below. The two cool looking cars are on show in a cut-out window, one blue and one red and they go by the name of “Ground Shock” and “Skull”. When you open up the box, you don’t actually get to see very much, that’s because there isn’t much needed, but that isn’t a downside really, more to the point I would say that this is one racing game whereby the minimal number of parts and wires is great as it makes for far less clutter and fewer bits for the kids to lose or stand on and break. In addition, it only takes a matter of minutes to set up and get racing, other kits can take a long time due to the way the smaller track pieces fit together (there are more sections as they are smaller) with various clipping mechanisms. Anki Overdrive tracks don’t actually slot together as such using clips, they have small but powerful magnets which attract each other and hold the sections firmly in place. This also makes it very easy to dismantle the track aswell as construct it. You can see the two small silver coloured magnets below – one on each side of the end section of track. As an example, a track can be built and ready to race in less than 2 minutes, so players can choose at any point to re-design the layout and start racing on a different shaped circuit without spending half an hour thinking about it. Notice that there are no track side impact barriers to prevent the cars from spinning off the raceway, they are extremely firm on the track even round corners at higher speeds and rarely come off. Other racing kits would have the problem of continually having to reset the cars into a slot when they crash – Anki seem to have found a technical way of getting round this to a large extent with the cars just sticking on the bends. A fairly interesting sideline here, the pack comes with four different mains power plug connectors, the product must be truly popular around the world! So where ever you are reading this review, you can be confident that plugging in your Anki Starter Kit won’t be a major problem! You’ll already be aware that most racing games which are mains powered apply electricity directly to the tracks via a transformer connected to the 240v mains. This means a trailing cable running from the wall to the track which is ALWAYS in the way. 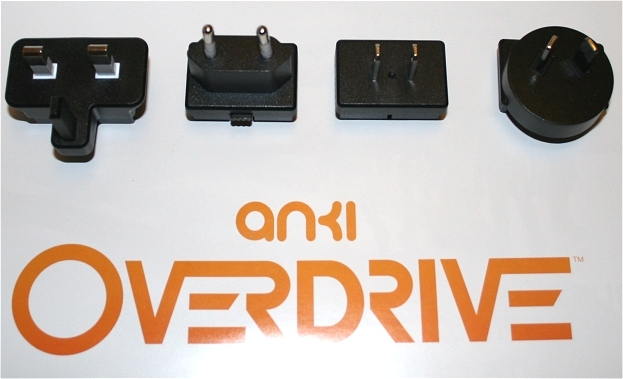 With Anki Overdrive the starter kit comes with a charger as shown below. The cars slot onto this and have a small internal rechargeable battery – which only takes around 10 minutes to reach full capacity. A flashing light on top of each car becomes stable when ready. Anki Overdrive Starter Kit Cars. The cars themselves are stylish futuristic battle machines – not the traditional formula 1 type super charged turbo grand prix format we are familiar with. Each car has the ability to gain new features and weapons via an app which steps the driver through a series of bot match type races which when won, unlocks the next gizmo. An example of this is a grapple line which particularly impressed my 9 year old, allowing him to fire on the opponent, drag his car back towards him and then “blast” him with another weapon. A fixed number of “upgrades” can be installed or activated on a vehicle per race, allowing the competitor to customize their car with features best suited to battle their competitor. 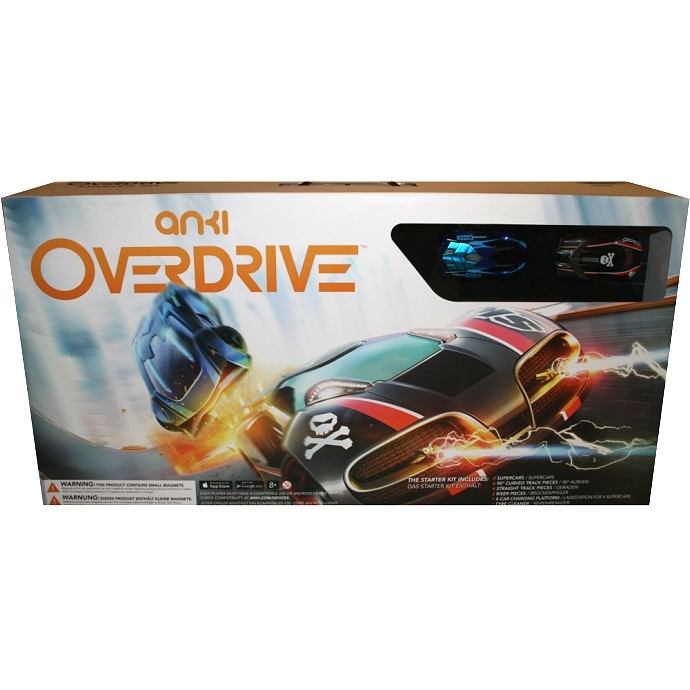 This is a very novel and unique ability on Anki Overdrive and is essentially one of the strong selling points of the kit. Basically you grow your profile and vehicle over time with various addons which are made available as the player climbs the ranks by winning races. This is very similar conceptually to developing a personalised avatar in an online console gaming scenario. As a feature or weapon is deployed during a race, the Anki Overdrive cars flash and beep – if the enemy car is within range and in the correct position, it will be affected by the attack in a manner depending on the weapon used – slowing down for example. Complicated isn’t it? The skill comes when the player is familiar with the best utilities for a given contender. To maintain the current status of a given player, we are encouraged by Anki to set up an account on their servers. This is performed via the app which is downloaded from Google Play or the Apple Mac Store depending on which tablet or smartphone you possess. 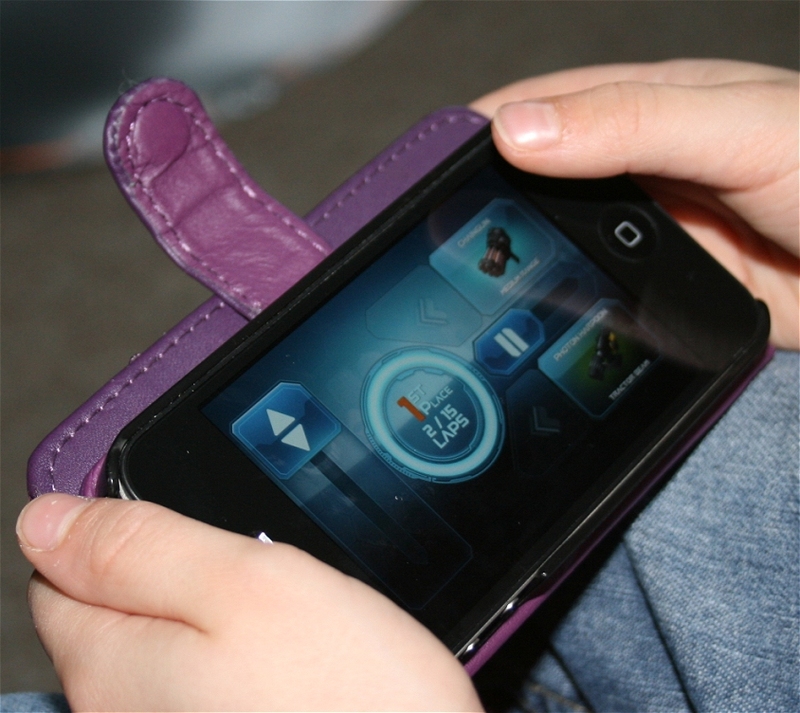 Once an account is created, the driver can log in and their current progress is downloaded facilitating the re-equipping of devices and gadgets earned in previous race sessions. This process takes only minutes to complete and once configured allows a player to be assured that their progress is safely stored away until next time. Controlling the Anki Overdrive Cars in the Starter Kit. Established brands of kids car racing sets have always incorporated a hand held trigger type controller which adjusts the cars’ speed by increasing and decreasing resistance of current to the track as the finger controlled trigger is squeezed and released. Anki Overdrive is different and here’s why. Now, this is where things get a little bit messy, and in my case actually spoil the fun. 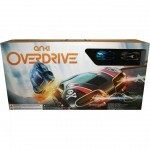 The cars are controlled by the special Anki Overdrive software app, which is downloadable from online as mentioned above. The problem is that the software is not compatible with all tablets or phones. The detail of the incompatibility is at this stage not clear, however, looking at Android for example, I would say that it may be to do with blue tooth – which is the protocol used by the cars to communicate with the app on the tablet or smartphone. There is a list of compatible devices (which have been tested by Anki) which are deemed suitable for use with the game at the anki support site. Tablets which have been tested by the manufacturer and are KNOWN to be incompatible have had the ability to download the software disabled. For example, we have two Nexus 7 tablets. One runs Android Marshmallow which I believe to be version 6, and the other runs Android 4. Visiting Google Play and attempting to download and install the controlling software displays a message which prevents the download from even taking place, as the Nexus 7 is not compatible with Anki Overdrive at least in terms of the starter kit which means pretty much everything it would seem. We also have another android tablet running lollipop – this one is a no brand if you like – and whilst it did connect and control a car briefly, it soon ran into problems with Bluetooth denying pairing with the cars and eventually informing us that the cars were “unavailable”. This left us with only one option, an older iPhone 4s – which thankfully works a treat – however we cannot race the kit between two players unless we go out and buy another tablet soley for the purpose of overdrive. Thankfully for the moment we can race against the system as it has a tournament section where a person can compete against bot cars which actually drive themselves – which in itself is technically superb as the car scans the track and races like a real human. Now I DID know in advance that this may be a problem, but I was hoping my unbranded tablet would work (or maybe clutching at straws my old Galaxy S2) – so I am to blame – not Anki – as they clearly stated that their systems require certain tablets. Naturally this did leave some tablets untested though and where this is the case Google Play does allow the download as untested tablets do not appear to have had the download feature blocked. Fair enough, they can’t possibly test every single device on the market. Racing with Anki Overdrive – with Video. Now that we’ve been through the ins and outs of the kit and controller compatibility problems we encountered, lets take a look at the cars going round the track in all their glory. At this point the video speaks for itself really, what you see is what you get. The figure eight race track took around 1 minute to assemble, the cars were already charged and we were driving in no time at all – two straight sections were still available for use. Initially, before a race begins, the cars scan the track to establish how it has been assembled – most of the turning / cornering is actually performed by the automated systems encoded into the cars – acceleration and deceleration along with firing at racing contenders is handled by the player. This is a spectacular display of technical accomplishment. This (below) is a bot type race against a commander – because as described – we can currently only control one car despite having 5 tablets/phones. I find it more realistic to see a video showing an item where it will actually be played with – rather than surrounded with fancy advertising graphics and unrealistic sounds and extras. These videos show pretty much exactly what you get – not what the ads say. The Anki App on an iPhone. In the photo below there is a quick screenshot showing the iphone running the Anki App. You can see the throttle control, the current race position you are in and the all important weapons selection. In summary, there is no denying that this is one heck of a cool bit of car racing kit for the kids. It’s only downsides really being the price and the biggest problem being the devices which will accept the app. This is a very big problem for us, as it will cost at least another £100 or so to get another driver racing simultaneously on it – which at the end of the day is essential. Overall – I like it but because of this – I don’t love it, but if you are prepared to spend on, or already posses the required devices – go for it. Tabletop Football Game for Kids Jump Star.